The sei whale (Balaenoptera borealis) (pronounced say) is a slim, streamlined rorqual, rather more bulky than the fin whale but still laterally compressed in the caudal region. It's back and sides are dark grey or bluish grey in colour, while the belly and ventral grooves are greyish white. Some individuals may have a white or light area to the flippers and a white streak may be seen extending downwards behind the ear. The flipper or the flukes are dark grey or bluish dorsally and ventrally, and the body often has a galvanised appearance due to light coloured scars inflicted by various types of parasites. The jaw, lips, and mouth cavity are uniformly grey. The head is 1/5 to 1/4 of the animals body length; the relative size of the head increasing with age. A pronounced longitudinal ridge begins at the highest point of the head, close to the blowholes, and extends to the tip of the rostrum. The head is less pointed than that of the fin whale and less rounded than the blue whale. The dorsal fin is 0.25 to 0.6 m high, strongly falcate and located 1/3 of the way from the caudal notch to the tip of the rostrum (slightly larger and further forward than in the fin whale). The flukes are small relative to overall size of this whale, their width approximately 1/4 of the body length. The trailing edge of the flukes is almost straight with a deep median notch, and the flippers are small and pointed (and shorter than those of the fin whale). Sei whales have fewer ventral throat grooves than the blue, fin or minke whales, varying in number from 30 to 60 and terminating midway between the flippers and the navel. The baleen is uniformly greyish black (blue or green tinged) with fine white or grey fringes. Some whales have a few lighter plates towards the front of the mouth and these can cause confusion in identification with fin whales. The longest plates measure 75-80 cm and the number of plates on each side of the jaw ranges from 300 - 400. The Sei is regarded as the fastest swimmer among the great whales, reaching bursts of speed in excess of 20 knots. When a sei whale begins a dive it usually submerges by sinking quietly below the surface, often remaining only a few metres deep, leaving a series of swirls or tracks as it move its flukes, and rarely raising its tail flukes as it dives. Sei whales often swim horizontally near the surface when feeding, in contrast to blue, fin and humpback whales that typically turn on their side to feed. When feeding in this manner, sei whales may exhibit a highly regular blowing and diving pattern over long periods, with blows at 20 to 30 second intervals followed by a dive of 15 minutes or longer. They tend to surface at a shallow angle - the blow holes and much of the back, including the dorsal fin, become visible almost simultaneously - and remain visible for relatively long periods. The sei whale is a cosmopolitan species, with a patchy oceanic distribution. It favours temperate, deep offshore habitat more than other species of large whale. In Summer, Sei whales do not move as far towards the polar waters as other rorqual whales and do not usually enter icy water. The wintering grounds in the open oceans are not known. 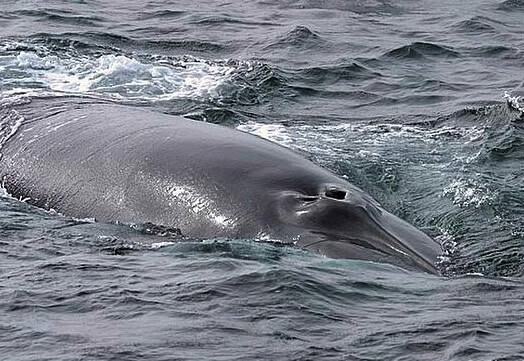 In the East Atlantic, sei whales are thought to winter off Spain, Portugal, and north-west Africa and to migrate north to northern waters off Norway, Shetland, Orkney and the Faroes. They are present in the Denmark Strait where they have been hunted until very recently. Whaling records and tag information suggests that sei whales are distributed from the Antarctic, South Georgia, the Falkland Islands to West Africa, Natal, (S Africa), western and south-eastern Australia and Brazil. The species has also been reported off of New Zealand in the Tasman Sea. There is a pronounced segregation of the sexes during migration - generally the pregnant females arrive earlier and mature whales stay longer. There is a general paucity of information on sei whale populations in the North Atlantic where there are now maybe only a few thousand individuals. In the North Pacific, there is thought to be about 14,000 sei whales, and an estimate of 17,000 was made for the Northern Hemisphere as a whole. The Southern Hemisphere population of sei whales is thought to number approximately 37,000. Sei whales can reach lengths of 18.6 m in males and 21.0 m in females, and weigh up to 30 tonnes. Females are generally about 0.5 m longer than males. Male Sei whales attain sexual maturity at 12.8 to 13.6 m in length and females at 13.3 to 14.0 m in length. Sei whales become sexually mature at 6 to 8 years of age. Calves are usually born in winter, after a gestation period of 10.5 to 13 months. A female gives birth to a single calf which is nursed for 6-9 months and the calving interval is 2-3 years. The sei feeds primarily on surface plankton; mainly copepods but also euphausiids - its food type varying according to temperature and latitude. The most common prey of the sei whale are Calanus copepods, but moving south, close to the Antarctic convergence, they are replaced by euphausiids, amphipods and Euphausia superba in polar waters. Sei's appear to feed opportunistically on whichever food species is most prevalent in the area, including small schooling fishes and squid in some places. Regardless of species of plankton, small fish or squid, the sei whale seems to select prey which occur in dense aggregations and in surface waters. They feed by skimming and swallowing in the surface waters. Plankton is skimmed from the water as the whale swims forward with its mouth open. Food organisms are caught on the particularly fine fringe fibres of the baleen plates. They may also gulp mouthfuls of water containing food. However, sei whales do not swim on their side when feeding, as in other rorquals. Sei whales are normally found alone or in groups of 2-5 individuals, though larger aggregations are found on feeding grounds. As with some other baleen whales, there may be some segregation in the population during migration. Pregnant females are among the first sei whales in the migration to and from the Antarctic, and in the Antarctic and North Pacific the older and bigger sei whales tend to be found at the highest latitudes. Sei whales less than 14.6 m in length usually do not venture south of the Antarctic convergence.